A nomination vote in Altona next week will determine which of four candidates will represent the Progressive Conservatives in the Borderland constituency. The riding formerly known as Emerson is considered a Tory stronghold. Nearly 73 percent of voters cast a ballot for the party in the 2016 provincial election. Last fall, Emerson MLA Cliff Graydon confirmed he wouldn’t seek re-election as an independent after allegations of sexual harassment led to his ouster from the PC caucus. The newly renamed riding also has new boundaries, as a non-partisan commission moved Otterburne, St Pierre, and St Malo into the La Verendrye constituency. In the run-up to Thursday’s nomination meeting inside Altona’s Millennium Exhibition Centre, The Carillon asked each of the four candidates about their priorities and experience. Josh Guenter was inspired to enter politics after living in the nation’s capital, where he studied economics, history, and public administration at the University of Ottawa. In his spare time, he worked for Saskatchewan MP Kelly Block. Back home, Guenter worked as a campaign manager and constituency assistant for Portage-Lisgar MP Candice Bergen, and as a legislative assistant for Morden-Winkler MLA Cameron Friesen. The 25-year-old long-haul truck driver lives west of Altona, and believes his young family is typical of many families across the riding. "We live in a young, dynamic, fast-growing part of the province," Guenter explained. "It’s important that we…elect a conservative who stands for traditional family values and will go to bat for the families of this area." Guenter said he shares the values of a typical Borderland voter. "I believe in faith, family, hard work, and personal integrity." The ever-rising cost of living and new federal carbon tax are making life less affordable for many local families, Guenter said, meaning Borderland’s next representative in the Manitoba legislature needs to keep families’ pocketbooks in mind. "It’s families that power our businesses and it’s families that run our farms," he said. "Family is at the centre, I think, of our community life here in this riding." Guenter said preserving affordability is also a way to retain young people in a rural region that offers plenty of economic opportunities. "Young families, I think, across the riding feel the pressure, and affordability is a big issue. Understanding these pressures, understanding the issues firsthand, makes me a natural fit to speak for this area," he said. If nominated, Guenter said he’d emphasize the need for roadway improvements, and support "more parental involvement" in the education system. If she becomes the PC nominee for Borderland, Verna Heinrichs says she’d practice the community advocacy for which she’s already known. A "love of learning" has led the University of Manitoba and Queen’s University graduate to leadership positions in numerous sectors, including health care, finance, agri-business, post-secondary education, and trade and exports. Calling herself "a natural leader," Heinrichs, who declined to provide her age, currently trades corporate stocks and resides near Altona. Heinrichs has helped 19 newcomers and their families settle in the Borderland area. She said she’d like to see a further streamlining of the settlement process to ensure the region’s farms and manufacturing businesses have an adequate supply of skilled labour. Heinrichs was instrumental in establishing a Red River College satellite campus in Winkler, and served as its founding director. She is a current appointee of the Manitoba Women’s Advisory Council. A former health care instructor and palliative care auditor, Heinrichs supports the health care delivery reforms the PCs have carried out since forming government three years ago. The changes have increased accountability and efficiency, she said. "That can only serve people much better." However, access to rural mental health services can improve, she said—an insight she gleaned while serving as the founding president of the Canadian Mental Health Association’s southern Manitoba chapter. As she’s knocked on doors, Heinrichs said she’s heard the province must change the way it taxes farmland, and examine onerous trade and export regulations. She said she’d also like to see fibre optic internet rolled out to more rural municipalities. Her Borderland run represents her first foray into political politics. Heinrichs declined to name a former Conservative federal cabinet minister who she said "strongly recommended" her to seek elected office. Morden resident Liz Hildebrand works with Junior Achievement Canada overseeing nine high schools that participate in the organization’s youth business education programming. 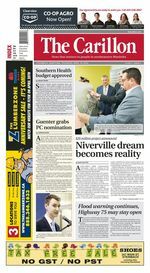 The 49-year-old, who was born in Vita and raised in Roseau River, has never before sought a political nomination, but has a history of involvement with the PC party. Hildebrand was Morden-Winkler MLA Cameron Friesen’s campaign manager in the 2016 election, and served on that riding’s PC association executive before and after. A stint working in the Morden-Winkler constituency office left her with "a good ear for listening to what the constituent wants." Hildebrand obtained a business administration diploma from Assiniboine Community College and was recently certified as a mediator. She has held church leadership positions and helmed local parent advisory committees, where she "tried to be the voice for the unheard." Connecting with party members during the nomination race has changed her mind on some issues, and taught her the danger of clinging too tightly to what she termed "pet projects." "I have done a lot of listening," she said. Noting the province’s review of K-12 education is on many voters’ minds, Hildebrand said she agrees with the comprehensive re-evaluation, but wishes its mandate would focus more on education funding models and the burden school taxes place on farmland. "We are the only province in Canada that funds education the way we fund it," she noted. Hildebrand said she’d also prioritize strategic infrastructure projects, especially those that would develop the economic potential of the riding’s eastern portion. "Economic development will never happen if we don’t have the infrastructure." For instance, Provincial Road 201 improvements would reduce the need for heavy trucks to complete lengthy detours, she said. "That is a major vein…to connect (Highway) 75 to the rest of the east." Rookie Town of Altona councillor Jordan Siemens believes a jump into provincial politics will allow him to ensure rural priorities are heard on Broadway. Raised on a farm near Horndean, Siemens does sales and support work for customers of Altona’s Greenvalley Equipment Inc. When the 26-year-old was elected to Altona town council last fall, he "had no intention" of running provincially before his term expired. That changed when, as a member of the Borderland PC association executive, he realized he possessed the professionalism and knowledge base needed to be a strong voice for Borderland. "I knew the people who were signing up, and I wasn’t really seeing a candidate who met the criteria, and I had a lot of people who were asking me to run," Siemens recalled. He views his youth as an asset, not a liability. "You just ask different questions if you’re a younger person. You have maybe a little bit of a longer outlook going forward and you aren’t as worried about doing things the way they’ve always been done." Siemens graduated from Providence University College with a bachelor’s degree in business administration and agriculture. While on student council, he helped organize a provincial election debate on campus. If he prevails next Thursday, Siemens said he’d defend issues of importance to the farming community, including lessening the education tax on farmland. Siemens said he’d also support regulatory reforms that would benefit farmers, such as shorter wait times for inspections. Siemens also pledged to "advocate for local control of school boards and health regions as much as possible," to preserve accountability. He also wants to remedy the region’s labour shortage by leveraging a new federal immigration pilot project for rural communities.